Burlington International Airport | Burlington VT Real Estate The Burlington International Airport services around 600,000 passengers annually with direct flights to Orlando, New York City, Philadelphia, Atlanta, Washington D.C., Charlotte, Chicago, and more. The airport is located in South Burlington, about 3 miles east of Burlington’s downtown business district, and operates 24 hours a day, 7 days a week. Direct travel service and international connections are provided by JetBlue, United, Delta, American Airlines, *Frontier and *Porter. U. S. Customs and brokerage services are located at the airport as well. Air cargo service is provided by United Parcel Service (via Wiggins Airways), and Federal Express. 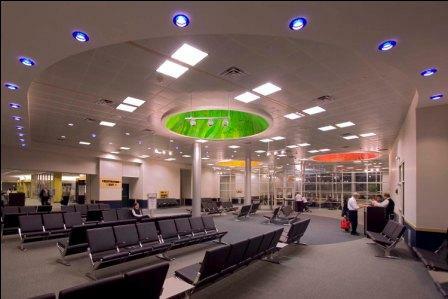 Passengers awaiting their flight or in between flights will enjoy the unique “Vermont feel” of the airport which features local marble, granite and maple in its design, and boasts local fare from the Skinny Pancake restaurant and its sister-company, The Chubby Muffin. Vermont artists are featured in rotating exhibits throughout the airport via a program with Burlington City Arts. There are several areas to relax and unwind away from the bustle of the airport including a Green Roof garden atop the parking garage complete with alpine plants, benches and a picnic table, a yoga room with Evolution Yoga, the ‘Skyway’ with a row of rocking chairs to enjoy the spectacular view of the runways and aircraft, and the observation tower at the east end of the second floor which affords views of planes taking off against the striking backdrop of Vermont’s Green Mountains. Visit more on the local information page. If you have other questions about life in Vermont or would like help finding a home in the Greater Burlington VT area, contact the Brian Boardman Group. You might also like to view our listings or start your own home search.